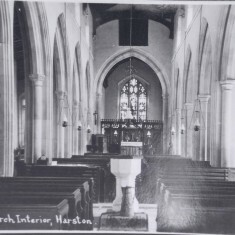 The curious moulding of the nave arcade entirely within the thickness of the walls, leaving the pillars and arches flush with the wall surfaces is another indication that church builders from Northamptionshire were involved. This accentuates the great height of the nave. The impression is increased by unusually narrow aisles, the South aisle being less than 4ft wide, perhaps a result of rebuilding the walls on the original Norman foundations. A piscina remains at the east end of the South aisle marking the former presence of an altar here. The aisle now has a 1933 relief of the Flight into Egypt by Lilian Edmunds, after Flaxman. 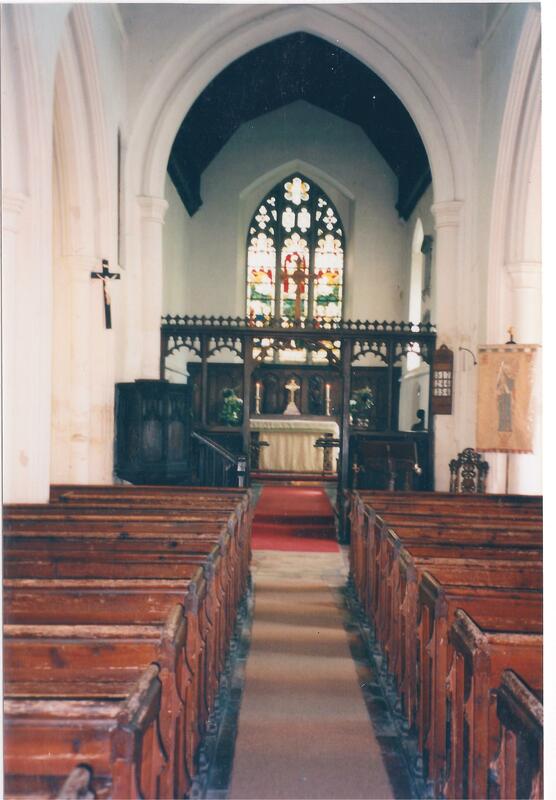 The previous chancel was built in 1599. The present one and the vestry were built in 1853-54 and re-opened on 24 February 1854. 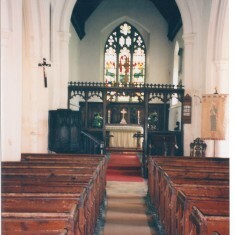 The East window was inserted in 1890. The foundations of the former chancel have been found when digging graves. They show it to have been eight or nine feet longer, and probably some feet wider. 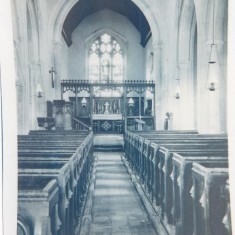 The chancel arch is the same date as the nave. The screen it contains is mostly modern, but some fragments of earlier work were incorporated. The royal arms hanging above the arch are of Queen Victoria, 1846; but these were painted somewhat crudely over earlier arms. The north aisle is expanded into a chantry chapel, of the same date as the rest of the fabric, though it projects a little beyond the north wall. Its piscina remains, in the wall of the rood stair turret. 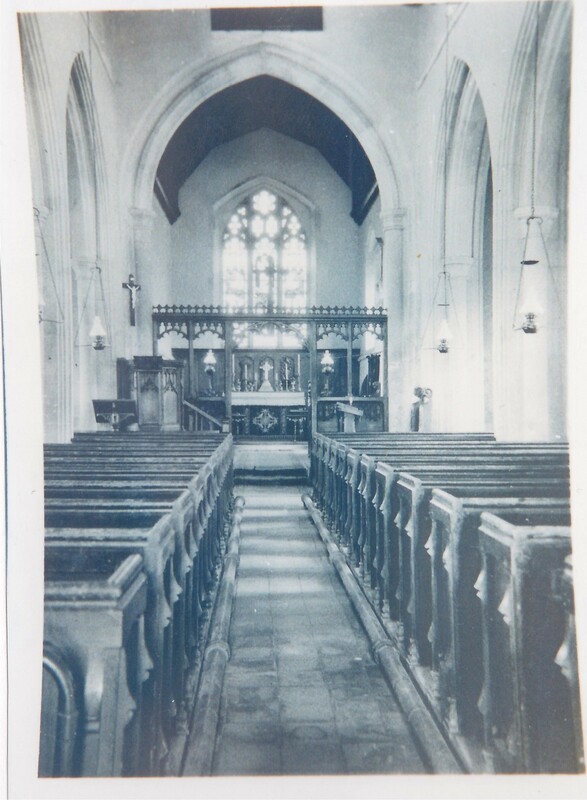 Like most Cambridgeshire churches of this age, it was visited by Cromwell’s parliamentary agent William Dowsing who noted in his diary that on 12 March 1643 twelve ‘superstitious’ pictures’ ie, stained glass windows were broken and a brass inscription was taken up. Some fragments of old glass can be seen in the windows of this chapel, the shields being all that is left of the 26 similar shields observed in various windows when it was visited in 1743 by Cole, a local antiquary. He noted that some of the old glass was dated 1449. Cole also mentions that on the east wall is a large projecting stone for an image with three plain shields on it. The pulpit, at the north-east corner of the nave is 15th century. Some of its panels have have tracery similar to that in the clerestory windows. Behind the pulpit can seen the doors to the turret stairs which were re-opened in 1934 after being blocked up for at least 200 years. These lead to the roof, and originally also to the rood loft, which has now been replaced by the Victorian screen which contains fragments of an earlier age. The organ has been in its present position, at the west end of the North aisle, since 1930,when a vault there was filled in .Before that it stood on a raised platform across the west end of the nave, filling the tower arch. It forms part of an organ formerly in Peterborough Cathedral, but only one or two stops now remain of that instrument. The case is mostly Victorian. The organ was completely rebuilt and extended by E J Johnson and Son of Cambridge in 1966-67. From the vault beneath came the fragments of corbels now on a window-sill in the South aisle. 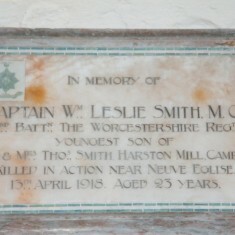 The Perpendicular style font is probably of the same period as the church and was placed in its present position in 1931.The modern cover was made in 1928. On the walls of the tower are several 17th and 18th century scratched inscriptions, which probably refer to the bell-ringers of the time. 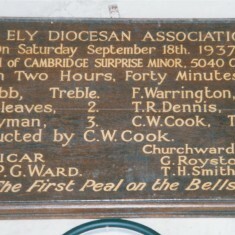 There were in pre-Reformation times three bells, and a fourth was added in 1560. 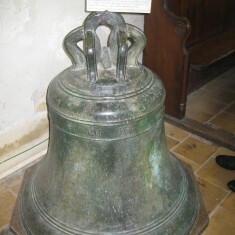 This bell is the cracked one now preserved at the east end of the North aisle, believed to have been one of only seven cast by Austen Bracker,the last pre-Reformation bell-founder. 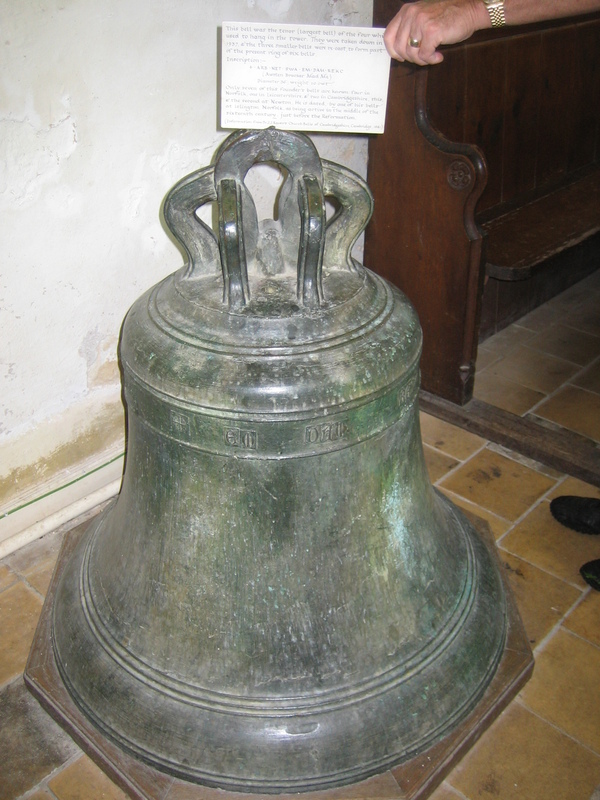 Four bells remained, with several re-castings, until 1937, when the present six were cast, three new and three re-cast, and hung on ball bearings in a new steel and iron frame by J. Taylor & Sons of Loughborough. 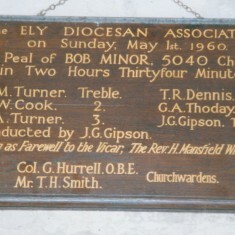 The three re-cast bells were previously re-cast in 1634 (treble), 1717 (second) and 1684 (third). 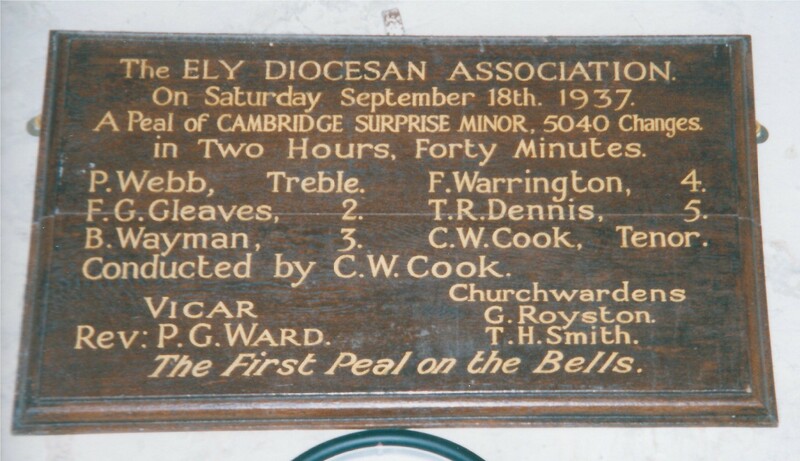 The six bells were consecrated by the Bishop of Ely on 20 June 1937. The surviving parish registers date from 1686; all except the current ones are deposited in the Shire Hall archives. 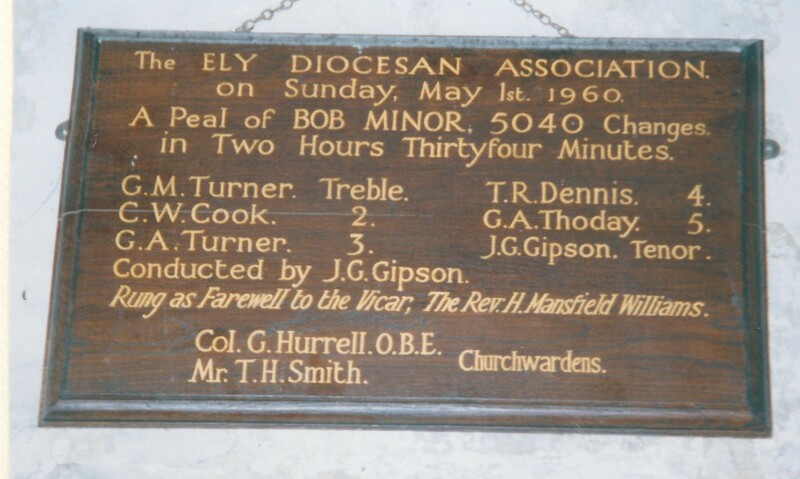 The Bishop’s Transcripts at Ely have entries dated 1599 showing that earlier volumes have been lost. 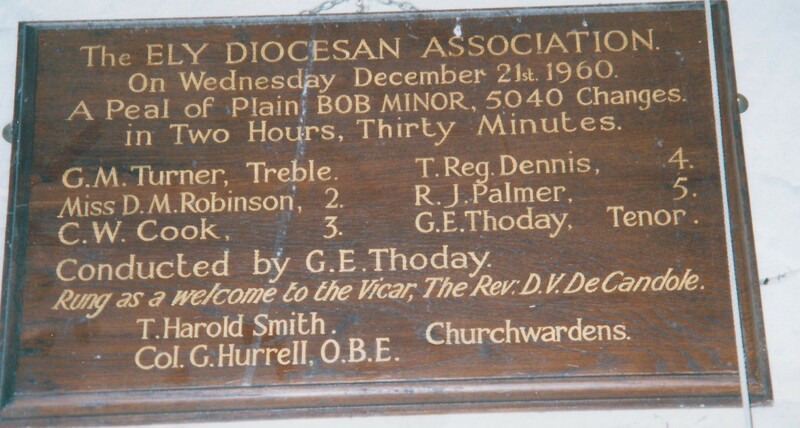 The list of Vicars starts in 1194 with Jocelin and is virtually complete from 1382. 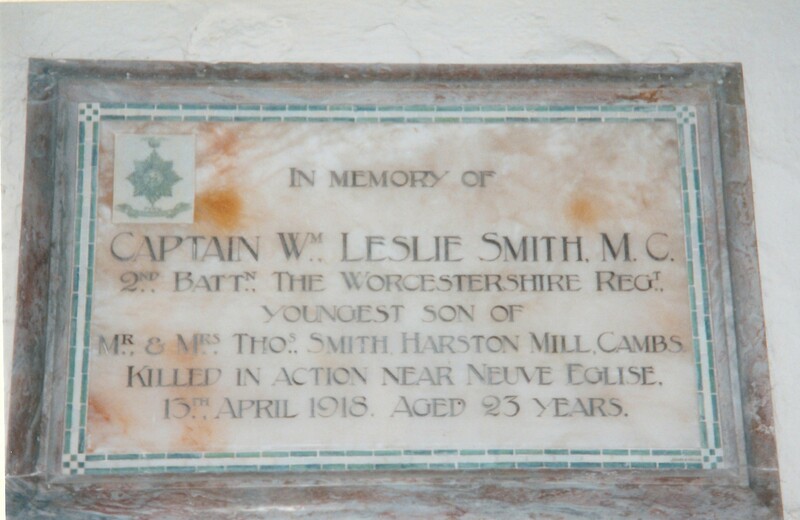 An interesting one was Matthew Wren, the uncle of the famous architect Sir Chistopher. 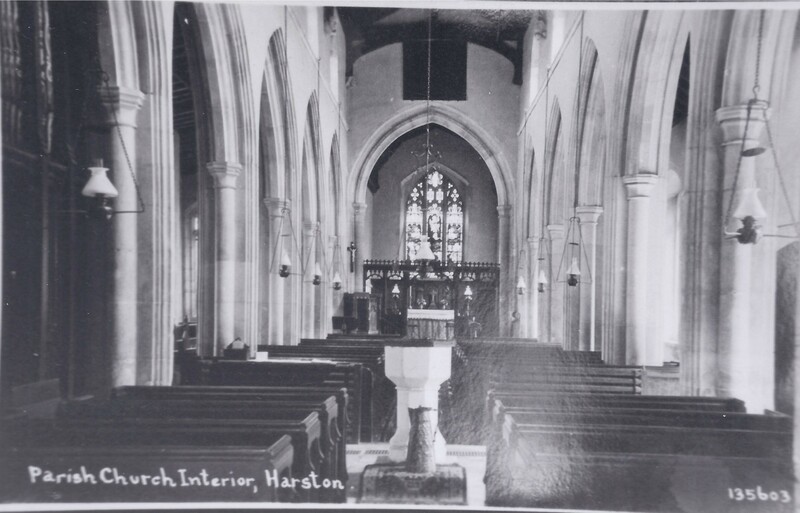 Harston was his first parish from1610 to 1614. 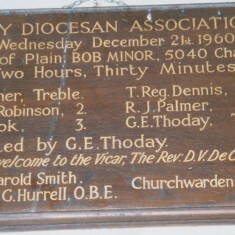 Later he became Bishop of Hereford, then Norwich and finally Ely. Manuscript notes by the medieval archdeacons of Ely of around 1278 record that the church had plate, books, vestments and many other things sufficient for it. Later came the confiscations of the Reformation period, followed by the puritanical smashing and in 1599 it was recorded that the church was ruinous. There is no ancient plate. In 1890 the late Georgian or early Victorian plate then existing was melted down to form part of the present plate, to which additions have since been made.